Season's greetings from everyone at Team Infused. To celebrate Christmas, we've decided that it would be the perfect time to do a giveaway. Thanks to our amazing sponsors, here's your chance to get your hands on some amazing prizes! 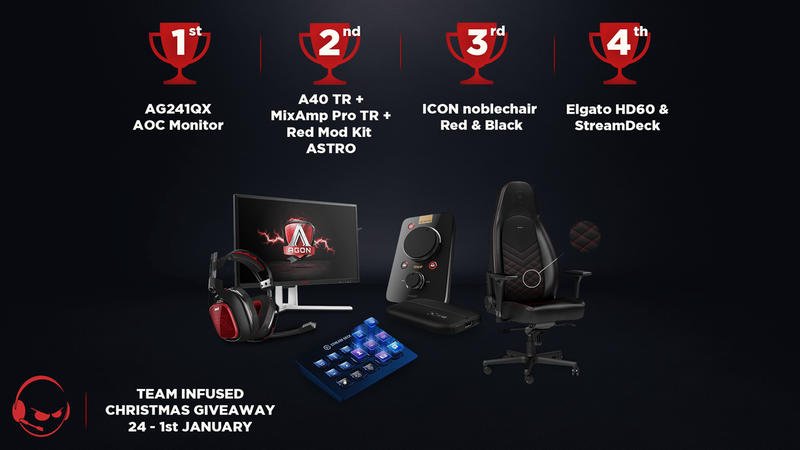 1st prize will recieve a brand new 24-inch AOC gaming monitor, 2nd prize will get their hands on a pair of Astro A40 TRs with a Mod Kit, 3rd prize will get a red and black Noblechair and 4th will get an Elgato HD60 capture card and a Streamdeck! What are you waiting for?! End 2017 on a high by entering the competition. You have to be in it to win it! You can enter by clicking here. Make sure to follow our sponsors on Twitter: Astro Gaming, AOC Gaming, Elgato Gaming and Noblechairs.